Bill and Veda Peters moved to the Outer Banks of North Carolina in August, 2004 from Woodbridge, Virginia, outside of Washington, DC, where they had lived for the last twenty plus years. Even though Veda is a native of North Carolina who grew up in the Raleigh area, their first visit to the Outer Banks was in August 1997 when they rented a home in the Village of Nags Head. After several other vacations to the Outer Banks (including one during Hurricane Dennis in 1999), they purchased a beach home in the Village of Nags Head in 2001. Bill enjoyed two successful careers, one in the Army Corps of Engineers for 23 years until retiring, and then in the Information Technology field for 15 years. In May 2003, Bill was caught in a corporate downsizing when his company was divided and sold off. This led to their decision to eventually relocate to the Outer Banks. Upon arrival in Nags Head, they temporarily occupied the Beach House they had purchased in 2001, and began looking for a business in which they could work together. After some searching, they found the Cypress House Bed and Breakfast in Kill Devil Hills. They moved into The Cypress House in May of 2005. Their first guest arrived a week later and they have been welcoming guests to the Bed and Breakfast since. Bill and Veda, and their son, Stephen (17), and dog, Sassy (1), live at the Cypress House Inn full-time. They have a growing family with adult children and grandchildren. Heather lives in Seattle. Susan and husband, Jeremy, and their children, Courtney, Aedan, and Kellen, live in Woodbridge, VA. Son, Bill lives in Los Angeles, CA and daughter, Jaclynn and granddaughter, Kayla live in Clayton, NC. 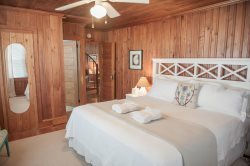 Bill and Veda both are committed to preserving this Grand Old Lady of the Outer Banks and retaining the spirit of the original lodge while updating its amenities and cottage style. Both strive to provide a casual but elegant atmosphere and want guests to feel comfortable and relaxed while here at the beach. Take your shoes off and stay a while!